Webs got its start in 2001 as a project of students and brothers, Haroon and Zeki Mokhtazarda. Although 2001 may not seem that long ago, it’s eons in Web years. Originally named Freewebs, the company changed its name to Webs in 2008. It still offers a free option for building your website, but is this old geezer still competitive with the new kids? Let’s find out. During the sign-in process, you’ll provide all the standard information for your website. After you enter your email address and password, you need to be ready with the title of your website, choose the category it will be in (professional, personal, etc.) and select the design and color scheme you want. Next, you’ll either buy a new domain, get a webs.com subdomain or connect your own domain. After you have provided all the required information, you’ll be redirected to the website builder and greeted with an introduction video. Especially helpful for beginners, the video will show you all of the basic information you need in about three minutes. You will get a free, custom domain with all packages. Connecting a domain you already own is free—even with the Free package, which is not an option offered by most competitors. However, testing the features in the paid packages is possible only if you pay for them. All packages come with 30-day, money-back guarantee, but there’s no free trial period. The drag-and-drop, WYSIWYG editor is extremely easy to use. If you’re a total beginner at website design, you especially, will appreciate this. If at some point, you decide to change your template, you’ll be able to do so without losing your content, sparing you the hassle of uploading it all over again. If you decide to add a new page, you’ll be asked which layout you’d like to use, which is helpful and not available with all builders. Finally, Twitter and Facebook social integration couldn’t be easier. If you want to design your site from scratch, you’re out of luck. You will be able to add custom HTML modules, but building a page from the ground up is not possible. This is good for beginners, but a limitation for advanced users. On the downside, Webs has one of the most aggressive upselling techniques we’ve ever seen. It’s typical that the more you pay, the more you get. But having your nose constantly rubbed in it is over the top. SEO, statistics, mobile builder and other features are severely limited or unavailable in Free and cheaper plans. Keep in mind that a lot of these capabilities are available from the competition with free or lower-tier packages. The Free package starts with 100MB of storage space, 100MB of bandwidth—and you can upgrade up to unlimited storage with 100GB bandwidth. Native advertising will be removed as you upgrade and you will get more email accounts, better statistics, a fully operating online store and more. But competitors offer some of these capabilities at a lower price. All in all, although there were no serious mistakes or missing elements, we feel that the ratio of pricing and what is available is somewhat off. Sure, the editor is easy to use, but leave out the updated, beautiful responsive designs and you have to question whether Webs is worth the price. Everything in the editor is drag and drop and the learning curve for basic elements is almost nonexistent. 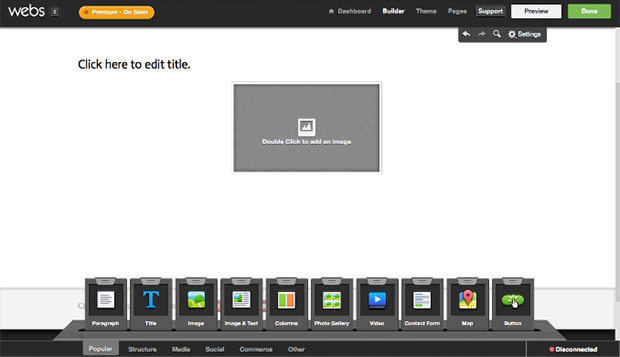 You have Dashboard, Builder, Theme, Pages, Support, Preview and Done in the header of your editor. Dashboard is where you manage domains, emails, SEO, statistics, mobile, basic website settings and more. Themes is where you can easily switch themes. Support is a quick search through FAQ. Preview is self-explanatory and Done is just another word for publish. What are we most interested in is, of course, the Builder and Pages section. Although they first appear to be separate, Pages are actually under the Builder section. The Dock is where you’ll focus most of your attention. It contains the majority of the building blocks, though it reminds us of some older versions of a certain OS dock. It’s divided into several parts; all are self-explanatory: Popular, Structure, Media, Social, Commerce and Other. Perhaps the most interesting feature, hidden in Other, is the Custom HTML module that allows you more customization freedom. There are helpful undo and redo buttons and there are predetermined page layouts. 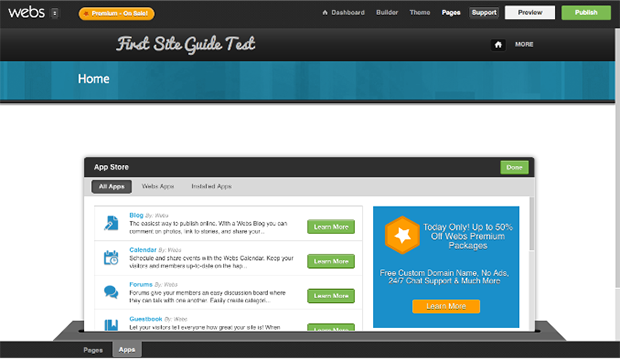 However, you can also add column elements to organize your page in a way that suits you the best. Adding columns is one of the easiest out there and, while on the subject of easy, header and footer editing is very drag-and-drop simple. While it’s quite easy to handle, more advanced users won’t be blown away. The Pages section is really easy to use and extremely beginner friendly. The Pages section is subdivided into Pages (yes, a repeat) and Apps. The Pages subsection is where you rearrange, add or delete pages. 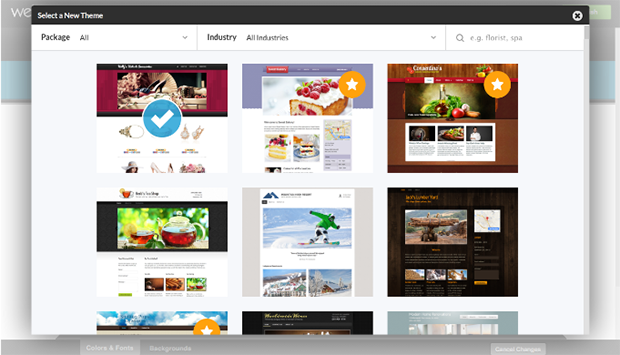 Apps is where you can add specialized pages like a Web Store, Blog and Photo Albums. All apps are in-house solutions; there’s no one-click install for third-party apps. However, you can add almost anything with the Custom HTML module. Templates are divided into free and premium options. Depending on the theme, you’ll be able to pick their color schemes. Some have only one color scheme and others offer multiple schemes. But this is where the design praise ends. The Design templates look outdated—enough so that their professionalism suffers. Without significant updates, Webs could slip off the radar solely because of this issue. Template customization is okay (not bad, but not great either) but the biggest disadvantage comes in the form of your mobile website. First, the templates aren’t responsive. Ok, that is fairly new thing, surely there is a mobile website editor? Yes. But you’ll have to pay for it. This is a serious blunder today, when we have smartphones that are more powerful than the first orbital satellites. If your biggest competitors have responsive themes or free mobile editors, having this as a paid upgrade seems…arrogant. If you want to work with your Store, you’ll find it under the Pages tab. Default paying options are Stripe and PayPal, and the number of products you can list is limited by the package you choose. Additionally, you can easily add PayPal, Buy Now or Donate buttons, which is a nice feature. The store, itself, is easy to manage and there are a lot of customization options. 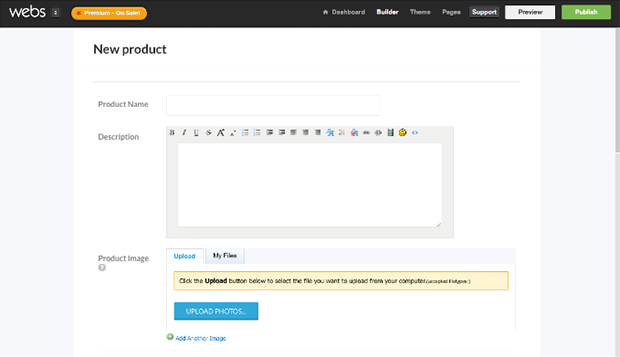 You can edit settings, categories and add products. The only baffling thing is that those buttons aren’t incorporated into Settings or in the Dock, so although they were visible right under the header, it’s easy to get confused. All in all, Webs offers a good, not great, e-commerce solution. SEO and Analytics are rudimentary with the Free package. There are a lot of demo videos, so you can peek at what’s available. SEO booster will allow you to work with basic things like meta descriptions, meta tags and page titles. It will show you if additions or adjustments you’re making to the site are effective, which is neat. Statistics, on the other hand, are basic with a Starter package and advanced with Enhanced and Pro packages. The more you pay, the more data you will get. But if you’re fan of Google, you can install their Webmaster Tool and Analytics, so you don’t have to depend solely on Webs’ products. 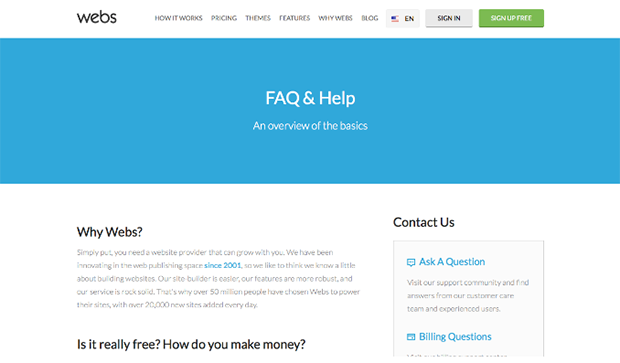 Webs’ hosting options are similar to the majority of website builders. If you opt for any kind of paid plan, you will get a .com, .net, or custom domain of your choice. If you decide to go with a Free package, you’ll have to make do with a webs.com extension. As with many other website builders, exporting your website is not possible. Webs’ help and support feel like an off-road ride. Sure, there is a knowledge base and community that you can search but it’s not as big as we are used to. One design remark: white background with very thin light blue or grey font, isn’t always the best design solution for reading while searching for answers.This could have been avoided by simply increasing the size of the font. If you want other options for communicating with the team, you’ll be able to send a ticket, but that’s it. If you want online chat or phone support you will have to pay for at least a Starter or Pro package. We get that the more you pay the more you get, but when you need support, you shouldn’t be assailed by aggressive upselling. However, their team response was timely and professional. Currently, four packages are available. All prices are for annual billing. Webs is a bit like your aunt at family reunions: a bit outdated looking, dodgy with certain topics and sometimes expects too much. But in the end, if you really need something done, your aunt always comes through. Webs also comes through—if you’re willing to pay. 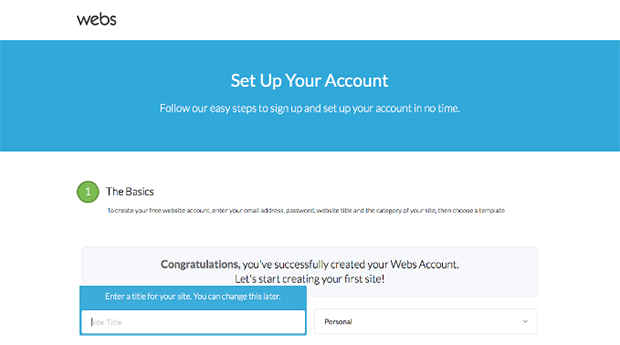 With no free trial, you can’t really test Webs before committing. There are a lot of apps and designs and it is really easy to use so if you are a beginner, you will have no problems working with it. However, not having responsive templates is a major faux pas. Remember, we are living in a smartphone world. Some time ago, the biggest advantage was that Webs pricing was one of the lowest in the market. Today the pricing is on par with others and sometimes offers less. There are very frequent discounts, but frankly, we think the discount prices should be the regular prices. 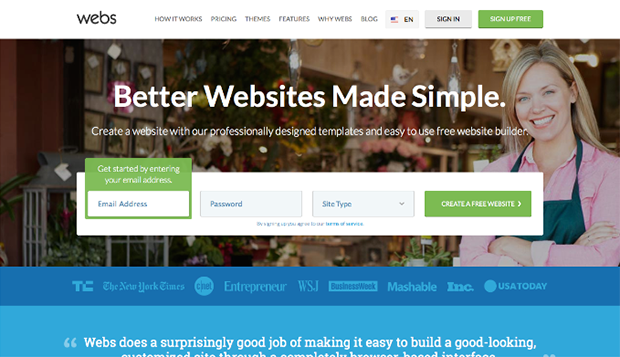 In the end, we can say that this is an okay website builder, but that’s about it. If you find it suitable for you, great, but we would recommend that you check the competition.